For many years students in Ethiopia were not educated in their own native language, and instead, they were only taught to read or write in one Ethiopian language called Amharic. 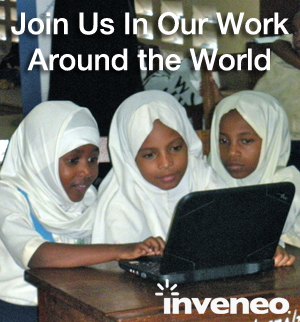 Inveneo is collaborating with the Ethiopian Ministry of Education and RTI as a partner in USAID’s Ethiopia READ project, a program that was created to enhance reading comprehension in one’s own native language for 15 million children in Ethiopia. To further the project, our Director of Project Management, Kassia Echavarri-Queen, and Project Engineer, Matt Crum, collaborated to create an ICT Showcase in Addis Ababa, Ethiopia that focused on discussing which educational ICT technologies would be the most efficient and suitable solutions for the Reading for Ethiopia’s Achievement Developed Technical Assistance (READ TA) program. The READ TA Project is a five-year program created to improve the early grade reading skills of young students Grades 1 through 8 across the country. The project now promotes teaching reading comprehension in seven languages that allow students to learn to read and write in their own mother tongue language. Representatives from certain organizations were also given the chance to present ongoing or completed ICT initiatives that would strengthen READ TA’s mission. Other participants of the showcase included representatives from the Ethiopian Ministry of Education, local ICT initiatives, and READ TA Partners such as RTI, CoreNet, and Whiz Kids Workshop. The showcase was not open to the public but overall still had about 80 attendees. As a first component in the READ TA project, Inveneo in conjunction with its local ICT partner Corenet did a baseline survey back in 2013. The survey measured ICT capacity in the College of Teacher Education (CTE), School Cluster Centers (SCCs), and satellite schools (which are all primary schools). Throughout the survey Inveneo measured power, current ICT equipment, Internet access, software in use, technical capacity, and current support plans (if available). From the survey Inveneo discovered that there’s diversity in all the CTEs and their individual capacity. Our exciting work in Ethiopia will continue to grow throughout the next several months. Inveneo plans to build tools to enable monitoring and evaluation for this project in case there are any technical issues. Looking for more information? Stay up-to-date with all of our projects by following us on Twitter or Facebook. *This article “Inveneo Presents at Ethiopian ICT Showcase in Collaboration with RTI” is made possible by the generous support of the American people through the United States Agency for International Development (USAID). The contents are the responsibility of Inveneo and do not necessarily reflect the views of USAID or the United States Government.